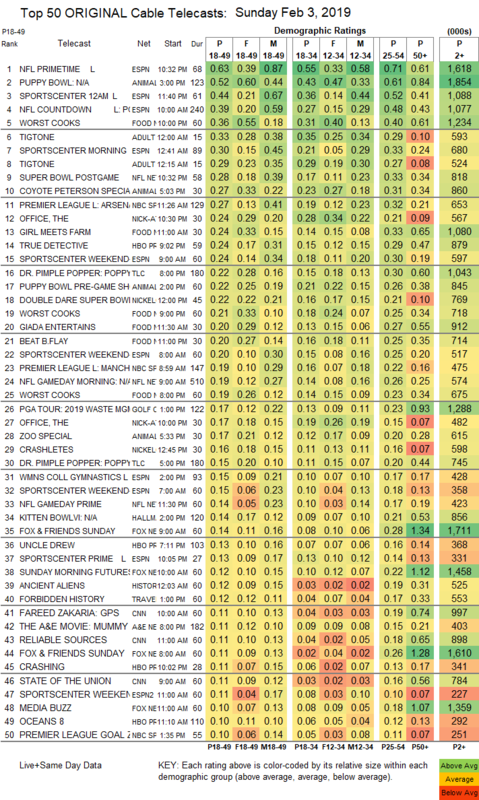 NETWORK FINALS: THE SUPER BOWL adjusted to 31.0, down 2.4 from 2018’s final number. CABLE HIGHLIGHTS: As usual, there were few alternatives on Super Bowl Sunday. Animal Planet’s PUPPY BOWL fell a sharp 0.39 from last year’s edition to 0.52, and its leadout COYOTE PETERSON was at 0.28. Food Network’s WORST COOKS IN AMERICA dropped a tenth to 0.36. Adult Swim’s late-night TIGTONE was at 0.33/0.29 compared to last week’s 0.34/0.31. NBC Sports Net’s PREMIER LEAGUE match was at 0.27. HBO had made its line-up available via VOD/streaming a few days early, and while TRUE DETECTIVE fell two-tenths to 0.24, CRASHING dipped only 0.03 to 0.11, and HIGH MAINTENANCE was actually up a tick to 0.09. A special BELOW DECK on Bravo was at 0.17. Hallmark’s KITTEN BOWL was down 0.03 from 2018 to 0.14. Starz’s COUNTERPART gained 0.02 to 0.07. 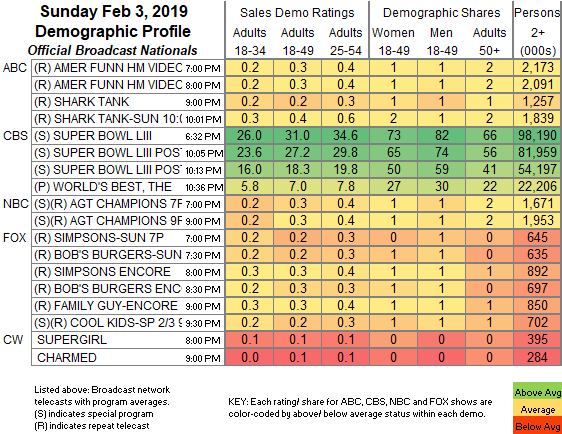 Showtime’s THE CIRCUS was down 0.02 to 0.05.